Eurail passes are a MUST if you backpacking Europe. This is your chance to see the remarkable European landscapes like you’ve never seen before. 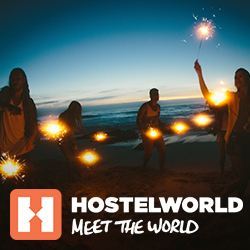 The great thing about staying at hostels is meeting other travelers and doing a bunch of fun things together. It’s pretty simple because hostel dorms have multiple beds inside them and so you’re most likely going to be bunking with 4, 6, 8, 12, and even 20 people or more in one room. Looks like fun. They couldn´t find anything illegal about it, so why not try it? Just off the coast of Spain, Ibiza is the party capital of Europe. If this video doesn’t want to make you backpack Spain and fly to Ibiza for some “R & R” then I don’t know what will! Habla español? If you’re traveling through Spain and aren’t in a huge rush, you just have to travel by train on at least one of your journeys. The Spanish countryside is beautiful and you won’t get to see that by plane. Traveling by Eurail is fun, especially if you are traveling with someone else or even a group. You simply have more freedom and can walk about and just be goofier than you would be if you were traveling by plane. These funny girls backpacked Europe and offered up some practical advice for your Europe backpacking trip. Gracias chicas!